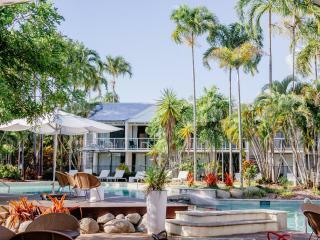 The ideal place to base yourself on your next North Queensland holiday, Mantra on the Inlet offers stylish and contemporary accommodation within walking distance of the famous Port Douglas art galleries, boutique shopping and award winning dining on cosmopolitan Macrossan Street. Accommodation at Mantra on the Inlet offers a range of sophisticated self-contained Hotel Rooms and 1 and 2 Bedroom Spa Suites designed around traditional colonial architecture with cedar accents and a modern range of amenities including air conditioning, full kitchen facilities, whirlpool spa and private balconies. Mantra on the Inlet also boasts an excellent range of onsite facilities including lush landscaped gardens, an expansive outdoor pool, a tour desk, undercover parking, direct access to a variety of shops and restaurants and easy access to a fantastic range of tours and activities including the Great Barrier Reef, Daintree rainforest and much more. Accommodation at Mantra on the Inlet offers colonial-style Hotel Rooms and self-contained 1 and 2 Bedroom Spa Suites. 1 Bedroom Spa Suite: Bedding is 1 King Bed OR 2 Single Beds. Maximum room capacity is 3 Adults & Children. 2 Bedroom Spa Suite: Bedding is 1 King Bed + 1 Queen Bed OR 1 Queen Bed + 2 Single Beds. Maximum room capacity is 5 Adults & Children. Accommodation at Mantra on the Inlet features self-catering full kitchen facilities however there are also a number of bars, cafes and restaurants located within walking distance of the resort. Great location. Middle of the action. We enjoyed our stay here. The apartments are set up very nice and is in a central location. If you want to be right where it's all happening, this is the place to stay. You get to hear the live entertainment from 3 different pubs every night. If you want quiet in the evenings you should probable stay at the other end of Marcrossan. Excellent room, location and value. Friendly and helpful receptionist.